We formulate the radiative transfer of P- and S-wave energy from an isotropically radiating source in a two-dimensional infinite isotropic scattering medium. 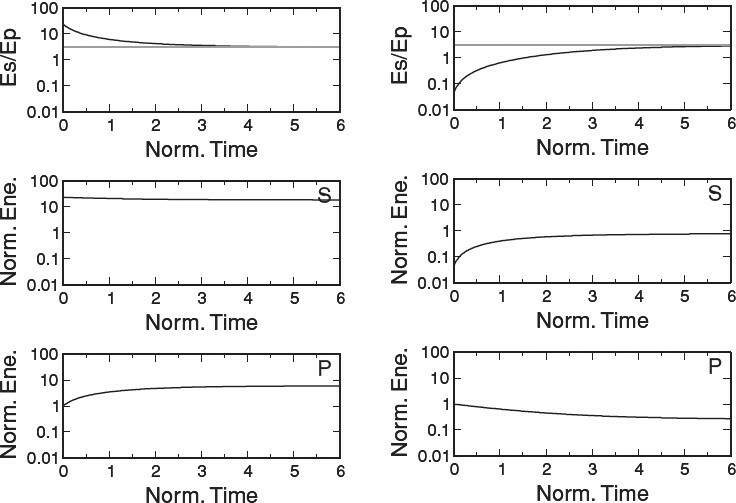 For a stable numerical calculation of seismogram envelopes, we take a semi-analytical approach: Energy densities of P and S waves are divided into three parts of the direct-wave terms, the single-scattering terms, and the multiple-scattering terms, and the first two terms and the last term are evaluated analytically and numerically, respectively. Concerning the single-scattering terms, the P- to-S and S-to-P single conversion scattering terms are expressed analytically with a complete elliptic integral of the first kind. The multiple-scattering terms are represented by a double integral with respect to frequency and wavenumber, and can be numerically evaluated by a discrete wavenumber summation and a Fast Fourier Transform. The results based on the numerical implementation are confirmed with an independent numerical calculation using the Monte Carlo method. Our formulation is also applied to consider the equilibration between P and S waves at larger lapse times. 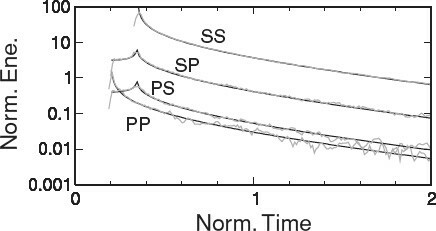 The equilibrated S-to-P energy ratio is reproduced and the equilibration time is first derived for two-dimensional cases. Our formulation will be a reference for the understanding of more complex cases. Seismogram envelopes have been used to estimate the strength of scattering and absorption in the Earth. Synthesizing realistic seismogram envelopes is needed to model observed envelopes and to invert for the strength of scattering and absorption in the Earth. Radiative transfer theory, which was originally developed in astrophysics (e.g. Chandrasekhar, 1960), is widely used in seismology, because it offers clear physical meanings and mathematical tractability. Various kinds of settings have been modeled using radiative transfer theory in seismology. For more detailed developments, readers can refer to Sato and Fehler (1998). Modeling started from the single scattering of scalar waves for an isotropic source and isotropic scattering in three-dimensional media (e.g. Aki and Chouet, 1975; Sato, 1977a), and in two-dimensional media (e.g. Kopnichev, 1975). Later, multiple scattering was included in the modeling for the three-dimensional case by Wu (1985) and Zeng et al. (1991), and for the two-dimensional case by Shan and Gao (1988). Vector waves (or P waves and S waves) were first considered for the single-scattering case by Sato (1977b) and for the multiple scattering case by Zeng (1993) and Sato (1994), all of which treated three-dimensional cases. However, concerning two-dimensional cases, we have only found a paper by Trégourès and van Tiggelen (2002) which derived a radiative transfer equation in a thin-plate bounded by two free surfaces. A canonical problem for a two-dimensional full space has not been found. The partitioning of P waves and S wavesisanimportant subject. The S-to-P energy ratio is known to be equilibrated after multiple conversion scatterings between P waves and S waves. The equilibrated ratio was elegantly derived for three-dimensional full spaces by Weaver (1982), and, later, for two-dimensional full spaces by Sánchez-Sesma and Campillo (2006). To consider the transition process into the equilibrium, radiative transfer theory for vector waves is necessary; see Zeng (1993), Sato (1994) and Ryzhik et al. (1996). Snieder (2002) proposed a simpler ball-counting method. The S-to-P energy ratio can be used to judge whether a wavefield is in a diffuse state (multiple scattering regime) or not. Shapiro et al. (2000) conducted the first seismic observation in this context and concluded that seismic coda is in a diffuse state. Sánchez-Sesma and Campillo (2006) clarified that the S-to-P energy ratio is also important to retrieve strict Green’s tensors from cross-correlations of noise records using seismic interferometry, which is a rapidly-growing field in seismology, acoustics, exploration geophysics, etc. (e.g. Curtis et al., 2006). In this study, we formulate the radiative transfer of elastic waves in a two-dimensional full space for the first time. Simple assumptions on the isotropy of source radiation and scattering enable us to derive semi-analytical expressions: the direct-wave terms and the single-scattering terms are analytically evaluated, and the multiple-scattering terms having an order higher than or equal to two are numerically calculated. The numerical implementation of our formulation is tested and confirmed by comparisons with the purely numerical approach of a Monte Carlo simulation. Finally, we discuss the energy partitioning of a P wave and an S wave in two-dimensional media as an application of our formulation. where ^ means Laplace transform, ~ means Fourier transform, and k=|k|. Schematic illustration of P-wave and S-wave energy propagation in a two-dimensional isotropic scattering medium. A source and a receiver are shown by a concentric circle and a gray rectangle. Propagation as a P wave and that as an S wave are shown by solid arrows and gray broken arrows, respectively. P-wave and S-wave energy which is radiated from an isotropic source is scattered and converted between P wave and S wave on the way to a receiver. On the right-hand side, the first term is a P wave which is radiated from the source as a P wave, scattered once into a P wave, and reaches the receiver. The second term is a P wave which is radiated from the source as an S wave, scattered once into a P wave, and reaches the receiver. This is a requirement for the analytical derivation of the single-scattering terms as shown in the next subsection and Appendix. The observed ratio of the attenuation of a P wave to that of an S wave for frequencies higher than 1 Hz mostly ranges between 0.7 and 2 in the lithosphere as shown in figure 5.3 of Sato and Fehler (1998). Therefore, Eq. (17) might be the first-order approximation. However, when this assumption does not hold in a strict sense, we need to make an inverse Fourier-Laplace transform of Eqs. (7) and (8) directly. In principle, it is possible to estimate the single-scattering terms both by integration in the space-time domain and the inverse Fourier-Laplace transform in the wavenumber-frequency domain. We can obtain P-to-P and S-to-S single scatterings by both methods (e.g. Sato, 1993). However, concerning P-to-S and S-to-P single conversion scatterings, we have so far only succeeded in deriving the analytical expressions by integration in the space-time domain using elliptical coordinates (e.g. page 46 in Sato and Fehler, 1998; page 1195 in Morse and Feshbach, 1953). Here, we briefly summarize the results. The detailed derivation is shown in Appendix. and K (x) is the complete elliptic integral of the first kind (e.g. page 590 in Abramowitz and Stegun, 1970). It is noted that this function also appears in the single scattering of scalar waves on a spherical surface (Maeda et al., 2003). When b = 0, the sum of the P-wave and S-wave energy is conserved, which means that our formulation is self-consistent. ρmax = 40.96 in this case. We assume that the damping of the medium is 0. However, we introduce an artificial damping in the wavenumber-frequency domain for preventing numerical instabilities. The artificial damping is compensated by multiplication of e bt in the time domain. We assume a Poisson solid of a0 = 6.0 (km/s) and ß0 = 3.46 (km/s). Concerning scattering parameters, we assume (km-1). Then, (km-1) and (km-1) are determined due to the constraints of Eqs. (17) and (A.10). The values might be larger for the usual Earth’s crust, but are comparable in a volcanic region (e.g. Yamamoto and Sato, 2010). We use such larger scattering coefficients because we are interested in multiple conversion scatterings and their influence on the partitioning of P-wave and S-wave energy as discussed in the next section. For these parameters, the range of calculation in real space and time is 0 = r = 409.6 [km], 0 = t = 34.13 [s]. It is necessary to check the numerical implementation of our formulation. For the calculation of seismogram envelopes, a Monte Carlo simulation (e.g. Gusev and Abubakirov, 1987; Hoshiba, 1991) is versatile enough to be applicable to any type of random media and source radiation at the cost of computation time. In this study, we use a two-dimensional version of Yoshimoto (2000), which is equivalent to Przybilla et al. (2006). For the calculation, we emanate 1,000,000 particles from the source. 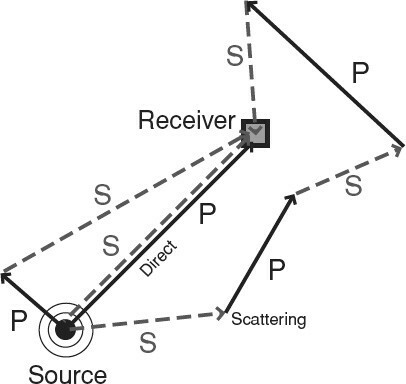 On the way to receivers, scatterings can take place probabilistically according to the assumed medium parameters. The time step is assumed to be 0.0167 s from . We count the number of particles arriving at a receiver and at a time. We can trace each particle from the source to the receiver by keeping track of the number of scatterings. So we can extract the single-scattering terms and the multiple-scattering terms separately even with the Monte Carlo method. The resultant envelopes are also normalized according to Eq. (31) for comparison with the envelopes based on our formulation. In Fig. 2, we show the energy densities of four single-scattering terms of P-to-P, P-to-S, S-to-P, S-to-S scattering at a receiver with a normalized distance ρ of 0.2. The horizontal axis is the normalized time τ and the vertical is the normalized energy density e P , e S as defined in Eq. (31). The panel shows the contribution of the four terms. Solid curves are obtained by our implementation. Gray curves are calculated based on the Monte Carlo simulation. Both traces show good coincidence with each other. Because W S = 1.5γ5W P = 23.38W P assuming a Poisson solid of , S-to-S and S-to-P single-scattering terms are larger than the other two terms. We also note that S-to-P and P-to-S single-scattering terms are similar as proved in Eq. (23). The P-to-P and S-to-S scattering terms have a square-root singularity at the onset times of P waves and S waves, respectively. The P-to-S and S-to-P scattering terms have a logarithmic singularity at the onset of an S wave. Both kinds of singularities are integrable. The Monte Carlo results show larger fluctuations at larger lapse times especially for a P wave due to the smaller number of P-wave particles. In Fig. 3, we show the contribution of single scattering (dotted curves) and multiple scattering (broken curves) in the total energy density (gray solid curves) at two receivers with the normalized distances of 1 and 2. The top panel shows an S wave and the bottom panel shows a P wave. The single-scattering term is dominant around the onset times of a P wave and an S wave. On the other hand, the multiple-scattering term grows soon after the P-wave onset. A small fluctuation in S-wave energy at lapse times between P-wave onset and S-wave onset is found. This is due to numerical instabilities which we cannot so far remove. However, we think that the fluctuation is not serious because its amplitude is less than 1% of the maximum amplitude of the S-wave energy. Energy density of four single-scattering terms of P-to-P, P-to-S, S-to-P, S-to-S scatterings at a receiver with a normalized distance of 0.2. The horizontal axis is the normalized time and the vertical is the normalized energy density as defined in Eq. (31). Solid curves are produced by our implementation. Gray curves are calculated based on the Monte Carlo method for comparison. Contribution of single scattering (dotted curves) and multiple scattering (broken curves) in total energy density (gray solid curves). The receiver is located at a normalized distance of 1 and 2 for the left and the right panels, respectively. S wave and P wave are shown in the top and the bottom panels, respectively. The single-scattering term is dominant around the onset times of a P wave and an S wave. The multiple-scattering term grows soon after the P-wave onset. In Fig. 4, we show temporal changes of P-wave and S-wave energy density at two receivers with normalized distances of 1 and 2. All of the direct-wave, the single-scattering and the multiple-scattering terms are included. Solid curves are from our implementation. Gray curves are calculated by the Monte Carlo method. Both traces show fairly good matches. This provides confirmation that we can correctly calculate P-wave and S-wave energy density by our proposed method. Temporal changes of P-wave and S-wave energy. The receiver is located at a normalized distance of 1 and 2 for the left and the right panels, respectively. All of the direct-wave, the single-scattering, and the multiple-scattering terms are included. Solid curves are from our implementation. Gray curves are calculated by the Monte Carlo method for comparison. We have succeeded in formulating the elastic radiative transfer for a two-dimensional random full space for the first time. This is a canonical problem. It is not easy to find practical applications. However, our formulation is useful from the viewpoint of the physics of wave propagation in random media. Our formulation makes it possible to understand directly the effect of dimensionality on the radiative transfer of elastic waves by comparison with formulations for three-dimensional cases. Another benefit of our formulation concerns the validity of seismic interferometry as discussed in this section. Recently, the partitioning of P-wave and S-wave energy draws attention to the applicability of seismic interferometry, as shown by Sánchez-Sesma and Campillo (2006). This is also of importance in investigating which is predominant between single scattering and multiple scattering in seismic coda (e.g. Shapiro et al., 2000). Intensive studies have been carried out so far in three-dimensional scattering media (e.g. Margerin et al., 2000). Our formulation enables us to quantitatively investigate the partitioning problem in two-dimensional scattering media, which has scarcely been considered. The relation (A.10) is used in the second equality. Equation (33) is consistent with a result in Sánchez-Sesma and Campillo (2006). For the Poisson solid, the S-to-P energy ratio will converge to 3 irrespective of the initial S-to-P energy ratio at the source. This is thanks to multiple conversion scatterings between a P wave and an S wave. And (A.10) shows that seismic waves tend to become S waves easily through conversion scatterings. The equilibration time is smaller in the two-dimensional case than the three-dimensional case for the same P-to-S total scattering coefficient . However, this becomes the opposite for the same S-to-P total scattering coefficient Therefore, the relation depends on the scattering coefficients. Temporal changes in P-wave and S-wave energy in all the space are shown in the middle and the bottom panels of Fig. 5. The top panel shows the S-to-P energy ratio. The gray line shows the equilibrated value of 3 which is expected for a two-dimensional Poisson medium at large lapse times as in Eq. (33). The initial value of the S-to-P energy ratio is 23.38 in the left panels. The ratio decreases with time and converges to the expected value of 3. This is due to the multiple conversion scatterings between a P wave and an S wave. The equilibration time of Eq. (35) is calculated to be 1.5 in the normalized time. In the right panels, we consider a case with a different initial value of the S-to-P energy ratio of 0.043 (= 1/23.38). For this case, the S-to-P energy ratio gradually increases with time and converges to the value of 3. From these tests, we confirm that the equilibrated value of 3 is irrespective of the initial value at the source and is the result of multiple conversion scatterings between a P wave and an S wave. Temporal change of P-wave (bottom panel) and S-wave energy (middle panel) in all the space. The top panel shows the S-to-P energy ratio. The gray line shows the equilibrated value of 3 which is expected for a two-dimensional Poisson medium at large lapse times. The initial value of the S-to-P energy ratio is assumed to be 23.38 and 0.043 for the left and the right panels, respectively. In Fig. 6, the bottom panel shows the S-to-P energy ratio at three receivers with normalized distances of 0.2, 1 and 2. The top panel shows the S-to-P energy ratio in all the space (or global equilibration) for comparison. Different from the global equilibration, it takes a longer time to reach the equilibrium at each point in the space (or local equilibration). At least, more than 10 in normalized time seems necessary for local equilibration. This is explained by the spatial distribution of energy: S waves are dominant close to the source, and P waves are rich close to an expanding propagation front. The local value of the S-to-P energy ratio remains larger than 3 near the source for a longer time due to S waves slowly diffusing outward, though the ratio in the entire space (global value) becomes 3 quickly. 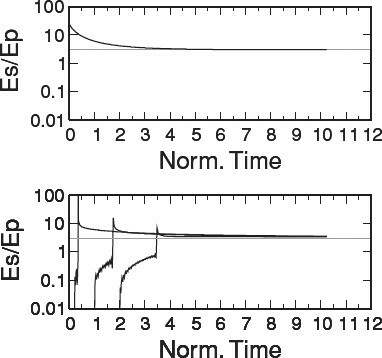 Temporal change of the S-to-P energy ratio in all the space showing the transition to the global equilibrium (top) and those at three receivers with normalized distances of 0.2, 1 and 2 showing the transition into the local equilibrium (bottom). Gray lines show the equilibrated value of 3 which is expected for a two-dimensional Poisson medium at large lapse times. We have formulated the radiative transfer of P-wave and S-wave energy from an isotropic source in a two-dimensional isotropic scattering media. For a stable numerical calculation of seismogram envelopes, we divide energy densities of P waves and S waves into three parts: the direct-wave terms, the single-scattering terms, and the multiple-scattering terms having an order of higher than or equal to 2. The direct-wave terms and the single-scattering terms can be evaluated analytically. Analytical expressions for the single scatterings are obtained in the spacetime domain using elliptic coordinates. Especially, the single conversion scatterings of P-to-S and S-to-P have been discovered to be represented by a complete elliptic integral of the first kind. Multiple scattering terms can be expressed by double integration with respect to frequency and wavenumber. Discrete wavenumber summation with respect to wavenumber, and FFT with respect to frequency, is adopted. The results based on the numerical implementation of our formulation have been validated by an independent numerical calculation using the Monte Carlo method. Using our formulation, we investigated the equilibration between P-wave and S-wave energy in a two-dimensional random full space. The equilibrated value of the S-to-P energy ratio has been reproduced and the equilibration time has been derived, for the first time, for two-dimensional media. Though our formulation is made for a canonical problem imposing simple assumptions of an isotropic source radiation and an isotropic scattering pattern, it enables us to see the effect of dimensionality on the radiative transfer of elastic waves. It is also helpful in understanding the mathematical background of radiative transfer theory. Constructive comments from the editor Dr. Tatsuhiko Hara and an anonymous reviewer are greatly acknowledged. We are very grateful to the other reviewer, Dr. Jun Kawahara, for pointing out many typing errors left in the original manuscript. We used Generic Mapping Tools (Wessel and Smith, 1998). This study was supported by Grant-in-Aid for Scientific Research (C) (20540413) and for Young Scientists (B) (20740248) from the Japan Society for the Promotion of Science (JSPS) and the Ministry of Education, Culture, Sports, Science and Technology (MEXT). We also thank JSPS and Deutsche Forschungsgemeinschaft (DFG) for support under the Japan-Germany Research Cooperative Program. where the ranges of coordinates are 1 ≤ υ ≤ ∞, -1 ≤ w ≤ 1, and the constant υ corresponds to an ellipse and the constant w corresponds to a hyperbola. The source is located at the origin z1 = 0 and z2 = 0 or υ = 1, and w = -1, and the receiver is located at z1 = 0 and z2 = r corresponding to υ = 1 and w = 1. The source-scatterer distance is , and the scatterer-receiver distance is . Here, the assumption of Eq. (17) is necessary to take exp(-ηt) out of the integral. which satisfies the equation is defined in Eq. (22). For the evaluation of the integral in (A.5), we need to divide the range of time into two parts. First is the time range where a P wave arrives but an S wave does not arrive. Summarizing the two cases, we obtain Eq. (20). Finally, the S-to-P single scattering term is considered. This relation holds for any type of two-dimensional scattering medium due to the reciprocity (e.g. Aki, 1992). Yamamoto, M. and H. Sato, Multiple scattering and mode conversion revealed by an active seismic experiment at Asama volcano, Japan, J. Geophys. Res., doi:10.1029/2009JB007109, 2010 (in press).